I drove north from Cairns (in Northern Queensland) to Port Douglas on the 3rd June 1987 and the next day travelled on a launch to Low Isles. View of island from Launch. 1pm, 4th June 1987, Arca-Swiss Monorail 5×4″, 150mm Linhof Schneider Symmar, Fujichrome 50, Polariser. You often hear people talking of living on a tropical island. Well, here is a candidate. Up until around 1990 you could get paid to live here, you just had to get selected as a lighthouse keeper. Lots of hard work, mind you. You may not be able to see, even if you click on the image, but there are two people, one at each end of the island and a fishing boat just off to the right. The lighthouse cottages are hidden behind the trees. There are a number of beach umbrellas on the edge of the beach. The beach up to the high tide line is public land so anyone can go there but the island itself is owned by the Government and access is restricted. Here is a similar view from closer. There is one person in the water near the left-hand end of the island and another on the edge of the beach near the lighthouse. 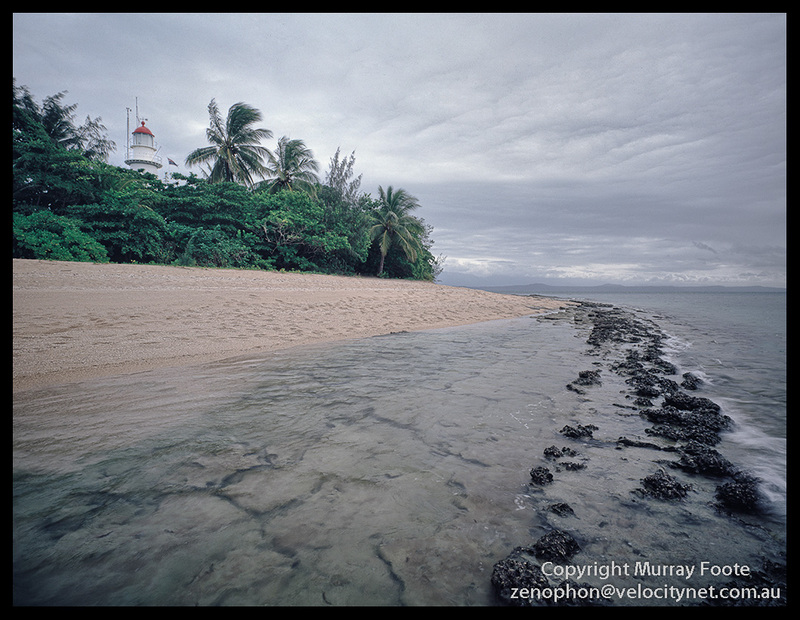 The island is inside the barrier reef so it is generally fairly sheltered and a keeper could always take shelter in the lighthouse in the event of a cyclone (same thing as a typhoon or hurricane except that the southern hemisphere ones go round in the opposite direction). The offshore reef is fairly shallow here with lots of fish, so a great place for snorkelling. Finally, a view from the edge of the beach. The island was probably not a great location for a construction site so the lighthouse and buildings were fabricated elsewhere and erected on the island, which was in 1878. Note: This Blog has just passed 30,000 visits, 200 followers and 100,000 words and is approaching 2,000 images and 1GB of space used. So thanks to all those who visit and motivate me to keep posting. This entry was posted in Australia, From Dusk Till Dawn and tagged Architecture, Australia, Landscape, Lighthouses, Low Isles, Photography, Queensland, seascape, Travel. Reblogged this on Leah's Blog.